Jaynation Music Flagship Act, Beambo Taylor Debuts With “Funwon finish”. The creatively crafted single, herald her launch into the ever competitive Nigerian market but it’s sure a tune that the label is banking on to give her due recognition. “Funwon finish”, exhibits Beambo's prowess as a lyricist. Rendered in her mother tongue of Yoruba language and sweetly blended with the English language, the song will surely delight all listeners. 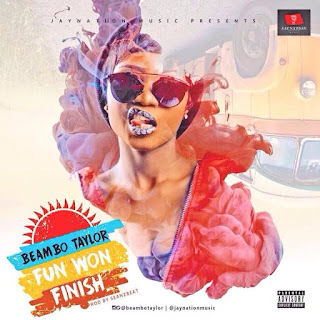 Beambo Taylor has been able to exhibit her rhyming skills at top-notch shows such as Dammy Krane's Amin Concert, The Itesiwaju Eko Concert and the just concluded Street Concert by Reminisce to mention a few. Her energy and attitude on stage is second to none. The multi-talented 22 year old rapper hails from Ijebu Ode, Ogun State and was born in Lagos. A Diploma graduate of Mass Communication from the prestigious Moshood Abiola Polytechnic (MAPOLY), Abeokuta. Beambo speaks English and Yoruba fluently and she raps smoothly in Yoruba. “Funwon finish” was produced by Seanzbeat, mixed and mastered by Marqai mix. Download, Listen and Enjoy!